I don’t like to overdo “time demos”, but I do love running some hands-off benchmarks that you at home can run as well (provided you have a license) so that you can accurately compare your performance to ours. 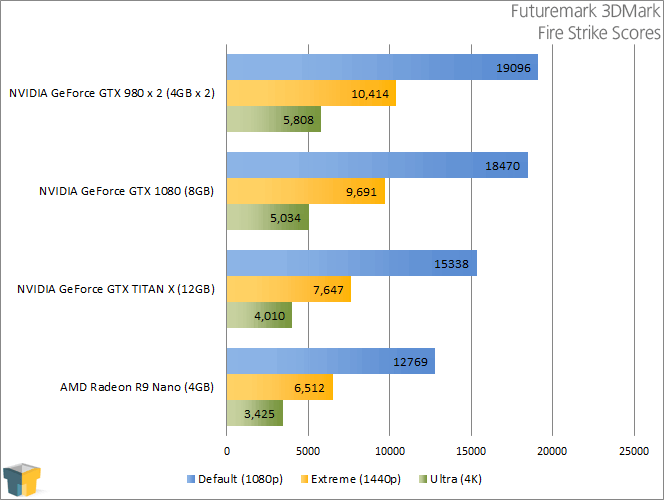 It goes without saying that any synthetic testing would have to include Futuremark, and in particular for high-end cards, 3DMark’s Fire Strike test. 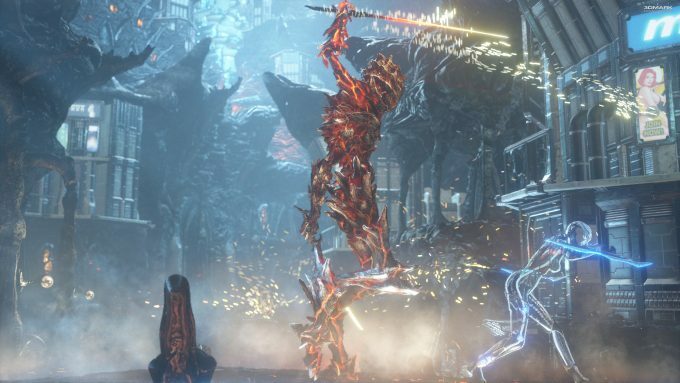 3DMark includes a number of different game tests, but today’s graphics cards are so powerful, the Fire Strike test is really the only one that makes sense. 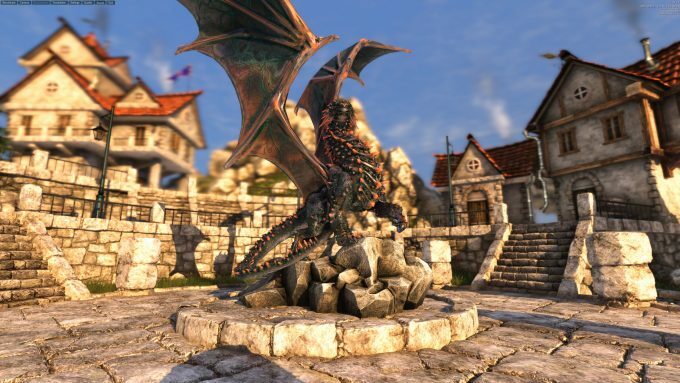 At 1080p, even modest GPUs can deliver decent performance. A great thing about Fire Strike is that the official tests encompass three different resolutions, including 4K, making it perfect for our testing. 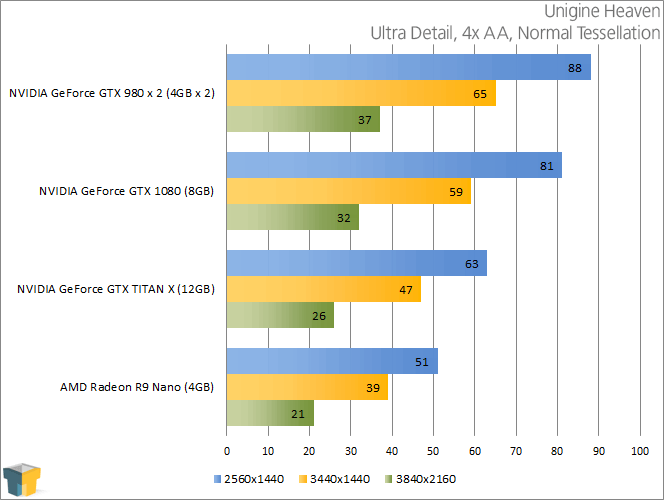 According to 3DMark, the 980 in SLI is faster than the 1080 regardless of the resolution it’s run at. 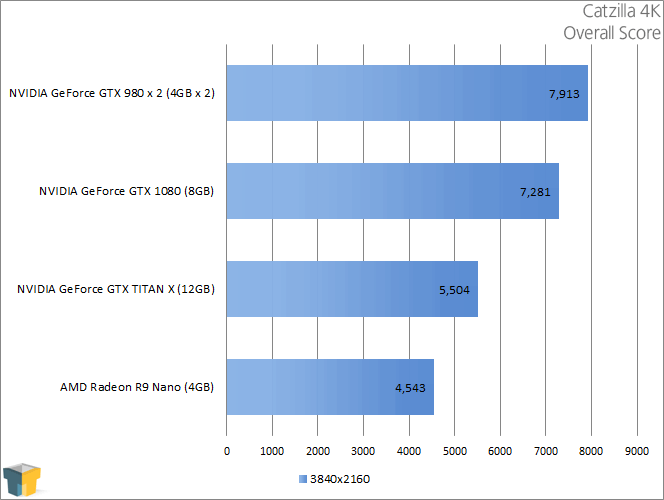 Compared to the TITAN X, though, the 1080 cleans up. It’s 25% faster than the TITAN X at 4K, and 27% faster at 1440p. It’s hard to tell at this point if Heaven is ever going to see a new update, as it’s been quite a while since the last one, but what we have today is still a fantastic benchmark to run. That’s thanks to the fact that it’s free, an also because it can still prove so demanding on today’s highest-end GPUs. It’s also a great test for tessellation performance, as it lets you increase or decrease its intensity. For testing, I stick with ‘Normal’ tessellation. Heaven agrees with 3DMark on the fact that the 980 x 2 is the ultimate configuration of these four. At 4K, the GTX 1080 is 23% faster than the TITAN X.
Meow hear this: there’s a new benchmark in town that promises to be purrfect for testing 4K resolutions. So, that’s just what I’ve used it for. The test consists of a cat innocently roaming a street until chaos ensues. Before long, this feline is mowing down buildings with its laser eyes, destroying GPU performance at the same time. 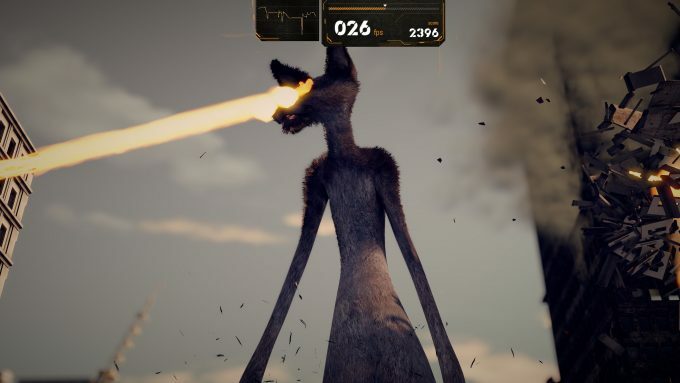 As it happens, Catzilla agrees with both 3DMark and Heaven: when properly utilized, SLI’d 980s reign supreme, but on the single GPU front, the GTX 1080 dominates the TITAN X, surpassing its score by 32% here.